By far one of the most popular queries we here at AACSB receive is regarding information about how a degree from an AACSB-accredited school contributes to the career of those who receive it. As we prepare to release the data from the 2015-16 iteration of the AACSB BSQ Employment Module survey, I thought I might treat our readers to a preview of the data that can help to shed light on that question. For those who may be unfamiliar with the survey, on it we collect information about the starting salaries for graduates at every level. To frame the context of what we collect, it is important to understand that all starting salaries reported are only for those graduates who were seeking employment (i.e., not already employed during their course of study, continuing their education afterward, etc.). Moreover, they are only those that pertain to employment seekers who received and accepted job offers either at the time of graduation, or within three months. In this way, we can be sure that the salaries reported were received on the basis of the degree earned. Source: 2015-16 AACSB BSQ Employment Module. Note: All data are from AACSB-accredited schools, and N=number of schools reporting salary data. I was surprised to note that, with a few exceptions, there was relatively little difference between the average starting salaries reported by public versus private schools, at both the high and low ends of the spectrum. It was mainly at the doctoral level that institutional control appeared to make any significant difference, and it is entirely probable that this is at least partially an effect of the small sample size of schools reporting at that level. The only other place where there was any significant difference was at the high end of the starting salaries for graduates of generalist business master’s programs. Given how little real effect institutional control appears to have as a differentiating factor for starting salaries at other levels, however, I suspect that there are other factors at work. Look for my next post, in which I will explore some of them. If you’ve been tapped into the news regarding higher education and business schools lately, you may be concerned by some of the words being used to describe the current landscape. There have been cries of enormous upheavals occurring at business schools, describing these changing times as any one of a slew of natural disasters, like the higher education tsunami, or earthquake, or avalanche. With this whirlwind landscape in a constant state of flux, how have business schools adapted their program offerings to the changing environment? 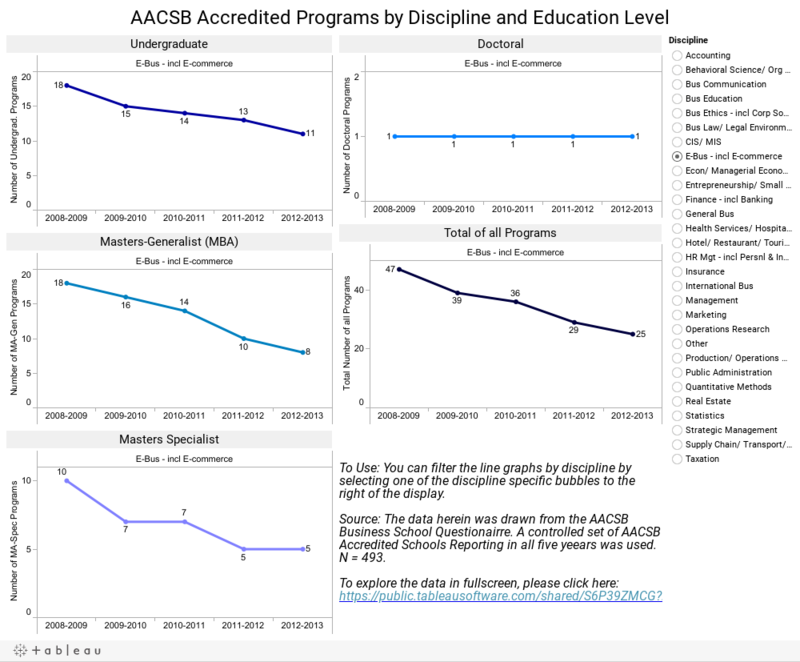 Using a controlled set of AACSB Accredited schools that responded to the Business School Questionnaire over the past five years, the following chart shows the percentage gains and declines in program offerings by discipline across all educational levels. Source: AACSB Business School Questionnaire, 2008-2009 to 2012-2013. Controlled set of AACSB Accredited Schools Reporting in all 5 Years. N = 493. I was immediately struck by the large falloff in e-business and e-commerce programs. This program has seen a whopping 46.81 percent dip over the five year time frame. On the flip side, business ethics including corporate social responsibility has seen a 37.50 percent increase over that same period. To drill down further, the following dashboard shares more details by displaying the changes broken down by educational level and the number of programs being reported. Is what we are seeing occur here in business school programming reflective of the times? When we look at the next five years’ worth of data, what programs will have seen the largest growth and largest decline?